Below are the list of main features of the plugin. Go through them before purchasing. Grid, Masonary, Carousel, Slide/s portfolio. 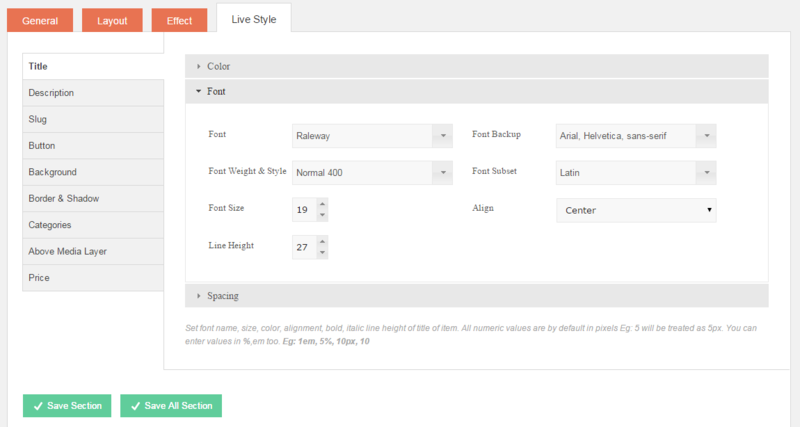 Control the number of columns for various screen resolutions and widths. (2,3,4,5,6 columns). 22 unique effects and 60 subeffects. Live CSS Editor/ No coding Required. Control cross browsers CSS effects of various elements like borders, backgrounds, fonts, paddings, margins, alignments, colors, shadow etc. Self Hosted Videos and Audio support integrated. 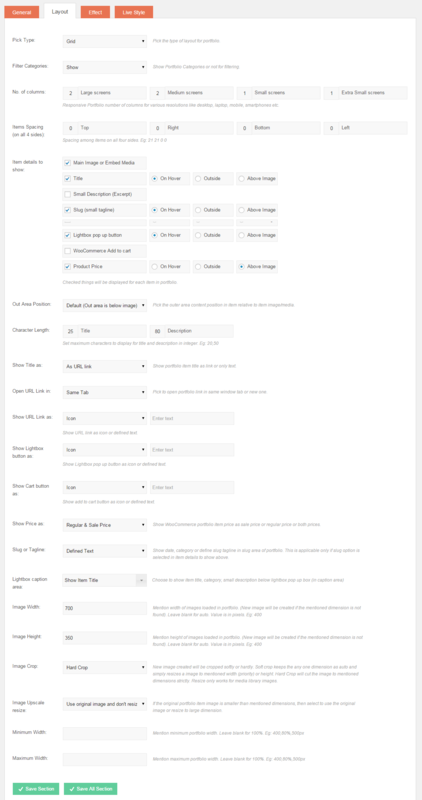 Fully customizable CSS and Style settings. Possible to customize or redesign all parts of portfolio from panel. Responsive lightbox supports any media type like audio, video, external video, images, embeded codes and HTML codes. Auto detect media in lightbox and keyboard support navigation. Control animation easing, animation effects and animation speed. Filterable portfolio with controllable animations. Compatible Wordpress 4.x, 4.0, 3.9.x, 3.8.x, 3.7.x and 3.6.x. New theme effects added regularly based on request. Create Fullwidth, Non spaced and Spaced portfolios. Embed external videos and codes like Youtube, Vimeo, SoundCloud etc. Simple and Easy to Use AJAX based Admin panel User Interface. Custom Category and Portfolio items management panel. Fully AJAX based user friendly interface. 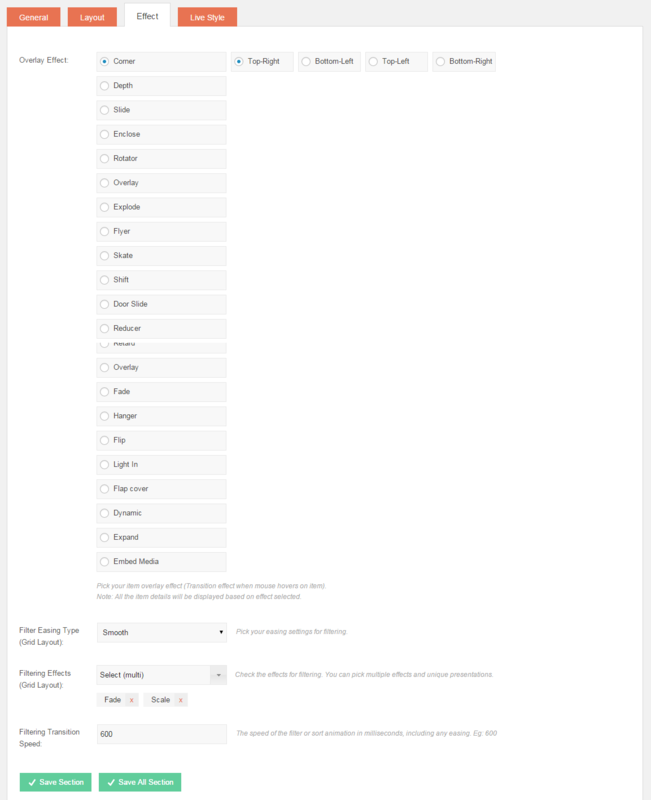 UPDATE: Plugin database category table structure updated. UPDATE: Plugin Admin Panel jQuery Not Found Issue Solved due to some external plugin conflict. UPDATE: Added missing text domains to Plugin Category list page and Plugin Dashboard page, Plugin Portfolio Item page in Admin panel, for easy translations. UPDATE: Fixed Plugin Template CSS file. UPDATE: Add portfolio item media issue fixed, (arising due to some external plugin conflict). UPDATE: do_shortcode() to embeded html code in lightbox added. UPDATE: Mixitup plugin for grid portfolio updated. UPDATE: Aqua Resize library modified to avoid duplication conflict with other themes and plugins. UPDATE: Demo media import file corrected. 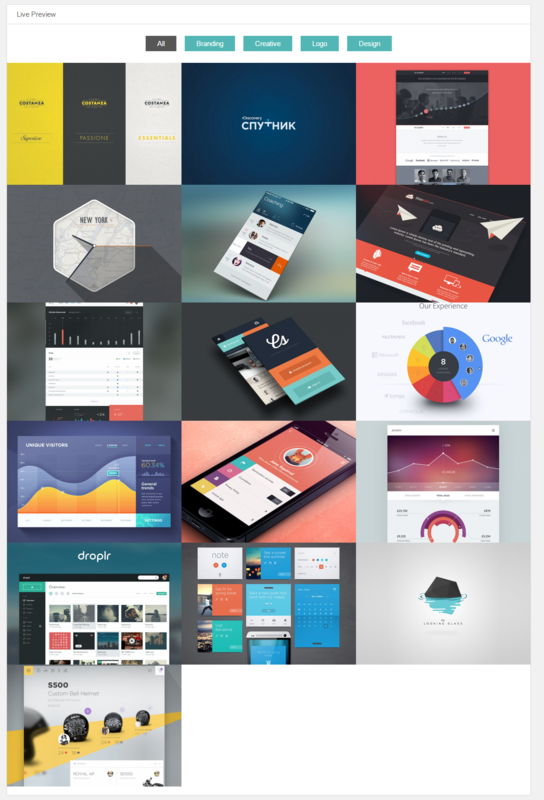 ADDED: Manual Sorting (drag and drop) portfolio items feature. ADDED: Automatic Sorting by portofolio item title, date, newest first etc. ADDED: Limit maxium number of items to be shown in a portfolio. FIXED: DateTime() class issue for servers running PHP version older than 5.3. Thus solving the issue of adding new portfolio items. Fixed: General grid and masonary scripts (already present and conflict) issues with any other installed plugin.